This cute little guy might look complicated to make, but the skill is all in the rolling! Perfect for children, the panda roll is a great way to introduce little ones to sushi – especially if they’re a little squeamish about raw fish. Using a sharp knife cut four slices of sushi grade tuna, making the first two slices 1cm in thickness and the final two slices 0.5cm in thickness. Transfer the four tuna slices into a small bowl and marinade them in soy sauce, ensuring that all of the tuna is covered. Leave the tuna marinating in the fridge for thirty minutes to an hour. Tip: Do not marinade the tuna for more than an hour, as after this point the tuna will begin to harden. Take the cooked sushi rice and add in 2 heaped tablespoons of wasabi masago. Add 1 heaped tablespoon of chopped coriander and gently mix with the sushi rice and wasabi masago. When mixing, ensure that you separate the grains of the rice to allow all of the ingredients to be spread evenly into the mixture. Be light and gentle when handling sushi rice. Put the green rice mixture to one side for use later. Take the tuna from the fridge and remove it from the marinade. To create the facial features of the panda, you will need to cut the tuna into the appropriate thickness, for example the slices for the eyes and ears need to be thicker than the ones for the nose and mouth. Lay down a sheet of nori horizontally and place the first tuna strip at the edge of the sheet. Wrap the nori around the tuna, ensuring the whole strip is covered, and cut off any excess nori. Repeat the process, wrapping the remaining tuna in nori until you have six strips: two ears, two eyes, a nose and a mouth. Put the ears aside for later. Lay out a fresh nori sheet horizontally. Take a small handful of white sushi rice and place it in the centre of the nori, spreading it evenly to create an oblong shape. Make sure that the rice reaches to the top and bottom of the nori sheet. Tip: Dip your fingers in cold water when dealing with the rice, as this will prevent it from sticking to your fingers and will enable you to manipulate it more easily. Take a thin strip of wrapped tuna and place it flat in the middle of the rice column, this will be the mouth of the panda. Add a thin layer of white sushi rice on top of the tuna strip, ensuring that the strip is completely covered. Place another thin tuna strip on the top of this, and then cover this with more white sushi rice. Again, make sure that the layer of rice isn’t too thick; there should be just enough to cover the tuna strip. 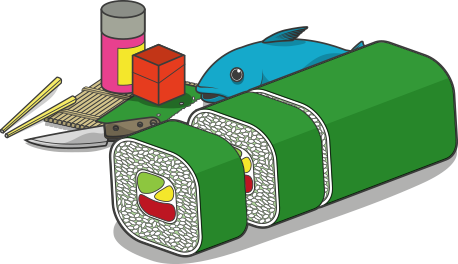 Finally, place the two thick tuna strips on top of the column to create the panda’s eyes. Add more sushi rice between the two strips. Pad out the sides of the existing column-and wherever else is necessary- with white sushi rice to ensure the panda has a rounded face. Take one side of the nori and curl it up and around the rice column. Repeat with the other side, ensuring that the two sides overlap at the top. Compress the roll by manipulating it gently with your hands, rolling it to ensure a smooth, circular shape (use a bamboo rolling mat if necessary). Take two sheets of nori and lay them horizontally. Glue the sheets together by adding a thin column of sushi rice to the edge of one of the sheets and sticking the other nori sheet over the top of this. Take the green sushi rice and cover three quarters of the enlarged nori sheet with it. Remember to be gentle when handling the rice to ensure it remains light and fluffy. Take two chopsticks and press them into the centre of the green rice about two cm apart, or wherever you want the ears to be. Remove the chopsticks, leaving two grooves. Take the final two pieces of rolled tuna and place them in these grooves. Take the panda face roll and place it on top of the ears you have just created. Ensure that the roll is orientated so that the eyes are at the bottom, closest to the ears. If needed, bulk out the top layer with more rice to ensure the roll is smooth and equal when you roll it. Wrap the top layer by curling one side over first and then the other. If the top layer doesn’t stick together, you can always add a few grains of sushi rice to act as glue. Take a sharp knife and dip it in cold water to ensure the rice doesn’t stick. When cutting the roll, try to use as little motion as possible. Slice through the roll by placing the heel of the knife at the top of the roll and bringing it down in a controlled movement. Cut each end off the roll first, then select the desired thickness and cut the roll into equal segments.